Avebury, in Wiltshire, south west England, is not only the largest stone circle in Europe, it is also one of the loveliest. Not too far from Stonehenge, and almost as famous, it is a Neolithic henge of three stone circles surrounding the village of Avebury. With open access to the stones, and a great pub at its centre, it is hardly surprising that Avebury is extremely popular with modern pagans pretty much all year round - but especially at times of festivals such as the Summer Solstice. Although the stones were almost certainly designed to track the movements of the sun and moon, there is something of a mystery about the original purpose of Avebury's complex set of circles and avenues. It was built by stone age people in the Neolithic era as part of a larger prehistoric landscape containing several other monuments, including West Kennet Long Barrow and Silbury Hill. Archaeologists are pretty sure these megaliths were used for ritual and ceremonial purposes, but it is hard to be certain who or what the stone age circle builders venerated. However, a new book by anthropologist Nicholas R. Mann, Avebury Cosmos: The Neolithic World of Avebury henge, Silbury Hill, West Kennet long barrow, the Sanctuary & the Longstones Cove, offers a theory as to why Avebury, West Kennet Long Barrow and Silbury Hill were built and how they were used by our ancestors. He says that the ancient Britons were inspired by a profound knowledge of the heavens when they erected these monuments. He examines exactly what the sky at night would have looked like when the megaliths were built. West Kennet long barrow was built first in the second quarter of the fourth millennium BCE, at a time when the Crux-Centaurus stars would first appear over that site at the start of winter. In time - over many generations - those using the monument would have noticed a slight shift in the stars relative to fixed points in the landscape. When that happened, they started to build the stone circles at Avebury in the valley nearby - and the first stones placed there were also aligned to the rising of the Crux-Centaurus stars. At around 3,300 BCE the Milky Way would have become level with and visible around the entire horizon of Avebury each winter. The stars of the Southern Cross and Cygnus would have pointed to the North and South Poles and making it seem as though Avebury was the centre of the universe. Other sets of stones were aligned to other stars and the stone circles were also aligned to the sun and the moon, and would have acted as calendars. Later, as the stars appeared to shift further away from this position of balance, Silbury Hill was constructed and lay at the centre of a new set of astral alignments. Eventually, however, the stars would have appeared to shift even further and the entire complex of megaliths and monument fell into disuse. Nicholas R. Mann offers suggestions as to what these arrangements of stars could have meant to our ancestors. They could have indicated the right times to do practical things, such as sowing seed, harvesting crops and butchering animals for winter, as well as indicating the correct time for rituals to honour the dead and perhaps venerate the gods of the land and the heavens. The stones would likely have been a focus for social activity and a centre of prestige, power and knowledge. They could also have offered a place where shamans could have more easily journeyed to other realms, using routes indicated by the stars. Publisher O-Books says on its website: "This book will help visitors and readers to see Avebury in a wholly new light - the light of the heavenly bodies that guided its Neolithic builders. Avebury Cosmos will reawaken our ancient reverence for the stars and deepen our respect for the extraordinary abilities and forgotten knowledge of our prehistoric ancestors." I certainly agree that Avebury Cosmos is a fascinating book and would recommend it to anyone with an interest in stone circles or who is planning on visiting Avebury either this Summer Solstice or in the future. 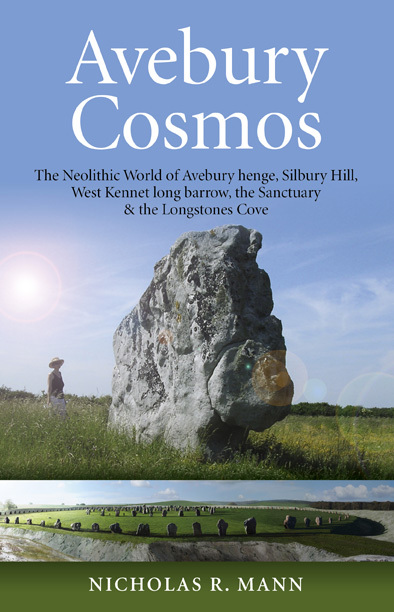 You can order Avebury Cosmos: The Neolithic World of Avebury henge, Silbury Hill, West Kennet long barrow, the Sanctuary & the Longstones Cove through Amazon.